Welcome to Penzance's Blue Seas Hotel where you will find comfortable bed & breakfast accommodation, friendly service and excellent food. 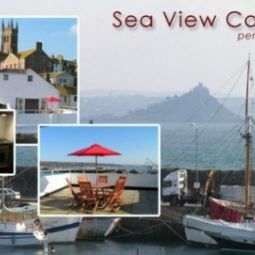 Located on the coast line overlooking Mounts Bay, we offer the comfort of a beautiful Regency house with all the modern facilities from high-speed wireless broadband to free view flat screen TVs. Restaurants, pubs and arts galleries are just a stroll away from us. Our highly praised breakfast figure only the very best of local and home made produces. Select from our large selection ranging from smoked haddock served with duck eggs to pancakes or eggs benedict. Location The Blue Seas Hotel is in a prime Penzance location. We are just ï¿½ mile from the main bus and trains stations, whilst the Scillonian ferry, Morrab Gardens, Penlee Gallery and Jubilee Pool are minutes away on foot. HOW TO FIND US Arriving by train Train is certainly by far the most practical and relaxing way to get to us. Both First great western and Virgin provide services from London, Scotland or anywhere else in the UK. Arriving by Coach National Express serves Penzance from most destinations throughout the UK. You can contact them at 08705 80 80 80 or visit www.National Express.com for more informations. Arriving by road The A 30 will take you all through Cornwall and now with the road work at Goos Moor nearly completed,access has never been so fast and so easy. Why don't you use www.getmethere.co.uk or www.theaa.com to plan your journey! !